– Rinse your toothbrush in hot water. Just by doing this is quite enough to keep a clean toothbrush. There is bacteria in the mouth that is necessary for health reasons. Therefore, it is not necessary to remove this bacteria from the toothbrush. 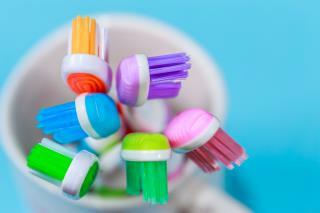 – If you see any discoloration, buildup or matting of the bristles, replace your toothbrush. It should be clean and the bristles should be straight. – Rinse well to dislodge any residual toothpaste. – If you’re not sure whether to replace it or not, replace it. It should be changed every 3-4 months or sooner if the bristles are no longer straight. If you have any sort of infection in your mouth, replace the toothbrush at the beginning of your treatment and again at the end. – Do not share a toothbrush. It’s not good to share the bacteria from someone else’s mouth, your mouth needs a healthy flora from its own bacteria. – Let your toothbrush breathe. Not letting it be in open air promotes growth of mold or bacteria that is unnatural to the mouth. This can cause many diseases, for example, gingivitis. Dr. Jared Bowyer DDS is a general dentist in Vancouver, WA. To learn more or if you have any questions, please visit our website or give us a call at (360) 253-2640, we will be more than happy to answer any of your questions.